My visual art works have been selected for solo exhibitions throughout the UK, including Anstruther, Cambridge, Dundee, Edinburgh, Glasgow, Kirkcaldy, London, Pittenweem, and the Scottish Islands. I have participated in group exhibitions in China, Europe, Russia, UK and USA. Many of my paintings and drawings have been purchased for public collections in the UK and private collections in Chile, Europe, Russia, UK and the USA. 1980: Diploma in Art, Drawing and Painting, Duncan of Jordanstone College of Art, Dundee. 1981: Post Diploma, Drawing and Painting, Highly Commended. Duncan of Jordanstone College of Art, Dundee. 1981: Royal Scottish Academy Carnegie Travelling Scholarship. 1981: Scottish Education Department Major Travelling Scholarship. 1983: Scottish Young Artist Bursary, Scottish Arts Council, a funded research trip to support my research in to St Kilda's bird culture. I spent 3.5 weeks on St Kilda. My paintings were exhibited at the Saltire Society, Edinburgh, in February 1985. Scottish Arts Council purchase. 1985: Royal Scottish Academy Latimer Award. 1989: Invited Artist, 'Scottish Art in Moscow', The Palace of Youth, Moscow. The first official British art exhibition in USSR since the revolution. 1990: Resident Artist, Crawford Arts Centre, St Andrews. 2001: 'The Navigatio', the story of St Brendan's epic voyage in a curragh around the North Atlantic to America in the C8th story. Conté pastels on paper at Kirkcaldy Museum and Art Gallery. 2017: 'The Navigatio' (1997-2017) at The Scottish Fisheries Museum, Anstruther. "My favourite colours are bright orange and blue. I think this goes back to a very early memory which pleased me very much of a deep blue sky set against a roof of Dutch inspired orange roof pantiles. Born in St Andrews I come from a long line of fishing families from the East Neuk of Fife. My earliest memory of drawing is aged 5 sketching whaling boats against dramatic sea stacs on the wall under the stairs in our house in Shetland. As a family we never lived far from the sea, the ‘Tail of the Bank’ in Greenock, near the Antrim coast in Northern Ireland and numerous family holidays Cellardyke, Fife and Waterfoot on the Mull of Kintyre. I now realise these experiences fed a continual stream of sea imagery in to my visual thinking. I spent five very happy years studying drawing and painting at Duncan of Jordanstone College of Art and Design, Dundee. We were taught by a diverse range of really strong principled personalities led by the charismatic Alberto Morrocco including Dennis Buchan, Bill Cadenhead, Grant Clifford, Peter Collins, Jimmy Duff, Jack Knox, David McClure, Tim Neat. We sat in on figure drawing with John Johnstone and Will Maclean. We enjoyed visits from Barbara Rae who was teaching at Glasgow School of Art at that time and Frances Walker from Grays in Aberdeen – a welcome female artistic perspective on what we were doing. And then of course James McIntosh Patrick obligingly left a dod of cigar smoke to denote he had ‘borrowed objects’ from our still life set ups. We thereby pestered him by return by taking our work to his Saturday class for an impromptu crit. I left Art College grateful for their encouragement and support and the skills they passed on to me. I was also determined to do things differently. I was lucky enough to win two travelling scholarships at the end of my post diploma year which enabled me to travel throughout Europe in the Autumn of 1981. The diverse range of work I saw ranging from the first exhibition of Picasso’s late work in Basel, The Glacier at the Jungfrau which Turner had painted, the stupendous collection of Breughels work in Vienna to the majestic ‘Adoration of the Mystical Lamb’ in Ghent were to inspire my ambitions as an artist for the next two years as I started my professional career. Since then my work has followed a narrative path like the Flemish Primitives I so admire looking at the bird culture of the Islands of St Kilda, my family’s involvement in the Scottish fishing and whaling industry. 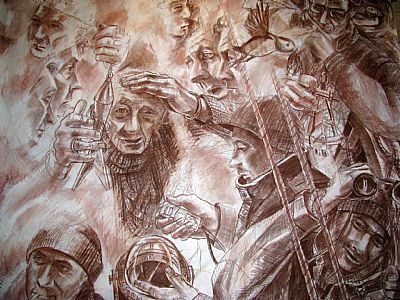 I have also worked on series which depicted the emergence of the hydro electric schemes in Highland Perthshire, the North Sea oil rig construction in Methil, Fife, and a series of pastel drawings depicting the voyage of St Brendan ‘The Navigatio’. Since returning to Fife I have been increasingly fascinated with the dramatic light effects on the rolling wooden hills and intensively managed farmland I see all around me. I only have to walk to the copse of trees behind my house to glimpse the sea, a reassuring sight for me." 1982: 'Carradale Landscapes', 'Terrorist Portraits' and 'Swiss Glaciers'. 1985: 'The St Kilda Bird Culture'. 369 at The Saltire Society, Edinburgh. 1986: 'A Time To Keep', East Neuk Fishing paintings and charcoal drawings. 1989: 'Hunting the Big Fish', charcoal whaling drawing series. 1990: Original drawings for the 'Sea Kings Daughter' commission. George Mackay Brown, 'Sea Kings Daughter', Balnain Books, 1991. 1991: 'A Flea On An Elephants Back', (RGC - oil rigg paintings), and 'Errochty Dam Drawings'. 1987: 'A Time to Keep', East Neuk Fishing paintings and charcoal drawings. 2001: 'The Navigatio', the story of St Brendan's epic voyage in a curragh around the North Atlantic to America in the C8th story. Conté pastels on paper. 1988: 'A Time to Keep', East Neuk Fishing paintings and charcoal drawings. 1989: Fife. 'Hunting the Big Fish', charcoal whaling drawing series. 1996: East Neuk Fife watercolours and oil nightscapes. 2003: 'The Navigatio', the St Brendan story, conte on paper. 1990: 'A Flea On An Elephants Back', (RGC oil rigg paintings). 1992: Paintings and pastels from Moscow series. 1993: A variety of paintings and drawings including fishing paintings and the 'Black Catch', charcoal drawings, Cellardyke pastels, Braer Oil Spill, North Rona landscape. 2000: New work including a few of the early drawings on 'The Navigatio' theme along with a series of oils, pastels and charcoal drawings with an East Neuk of Fife theme. 1981: 'Three New Artists from Dundee', 369 Gallery, Edinburgh. 1983-1988: Chicago International Art Exposition. 1984: 'Scottish Expressionism', Warwick Arts Trust, London. 1984: 'Four Young Scottish Painters', Aberdeen City Art Galleries. 1984: 'What Are Young Scottish Painters Doing? ', 369 Gallery - touring show. 1984: 'The New Wave', 369 Gallery, Edinburgh Festival. 1985: 'Society of Scottish Artists', Collins Gallery, Glasgow. 1985: 'Contemporary Scottish Landscape', City Art Centre, Edinburgh. 1985: 'A Festival of Scottish Painting', 369 Gallery, Edinburgh. 1985: Royal Scottish Academy Annual Exhibition. 1985: Society of Scottish Artists Annual Exhibition. 1985: 'Stonework', Scottish Arts Council Travelling Gallery. 1985: 'Scottish Contemporary Art', Clare Hall, Cambridge. 1985: International Contemporary Art Fair, London. 1985: Three Man Show, 369 Gallery, Edinburgh. 1986: 'Contemporary Scottish Painting', Perth Museum & Art Gallery. 1986: 'McLean Biennial', McLean Museum & Art Gallery, Greenock. 1986: 'Art Branching Out', Scottish Arts Council Travelling Gallery. 1986: 'Contemporary Sccottish Landscape', Chambers Institute, Peebles. 1986: '369 Group Show', Le Cadre Gallery, Hong Kong. 1987: 'Continuing the Tradition: 20th Century Scottish Painting'. 1987: '369 Gallery', Edinburgh and Warwick Arts Trust, London. 1987: 'Scottish Contemporary Art', Clare Hall, Cambridge. 1988: 'Three Person Touring show', The Piers Art Centre, Orkney. 1988: '369 and the Sea', Kellie Lodging Gallery, Pittenweem. 1988: 'Metropole Arts Centre', Folkestone, Kent. 1988: 'Tenth Anniversary Exhibition', 369 Gallery, Edinburgh. 1988: 'Contemporary Portrait Painting', 369 Gallery, Edinburgh. 1989: 'Scottish Art in Moscow', The Palace of Youth, Moscow. 1990: 'Painting the Forth Bridge', 369 Gallery and touring. 1990: 'Scots Myths', Scottish Gallery, Edinburgh. 1991: 'The Whale and the Artist', Barrack Street Museum, Dundee. 1991: 'Edinburgh Moscow', Georgian Cultural Centre, Moscow. 1991: 'Corporate Art', Design Centre, London. 1991: Beaufort House, London, Fine Art Consultancy. 1991: 'The Fife Special', Arts in Fife touring show. 1991: 'Christmas Exhibition', Scottish Gallery, Edinburgh. 1991: British Rail 'Trainload Freight' commissioning programme, inaugural exhibition, TFL HQ, London. 1993: Loomshop Gallery, Lower Largo. 1993: CD2 Collective Gallery, Edinburgh. 1993: 'Shoreline', Edinburgh City Art Centre, and touring. 1993: 'Portrait of the Artist', Scottish Gallery, Edinburgh. 1996: Society of Scottish Artists Annual Exhibition. 1997: 'Contemporary Scottish Art', Eastern General Hospital, Edinburgh. 1997: 'Festival Exhibition', Scottish Gallery, Edinburgh. 1997: 'Christmas Exhibition', Scottish Gallery, Edinburgh. 1997: 'IMAGE IN' Web site exhibition. 1998: 'Scottish Arts Council Bequest', Pittencrieff House, Dunfermline, and Crawford Arts Centre, St Andrews. 1999: 'Morrison's Portrait Award Exhibition', Royal Scottish Academy, Edinburgh. 2000: 'Expressions', Aberdeen Art Gallery and McManus Gallery, Dundee. 2001: 'Contemporary Scottish Art', Christie's New York Website Show, June 1 - 21. 2001: 'Festival Exhibition', Scottish Gallery, Edinburgh. 2003: 'Toil', City Art Centre, Edinburgh. 2011: 'Fraser Gallery', St Andrews. 2012: Rothes Halls Gallery, Glenrothes. 2014: Cobalt Gallery, Ovenstone, Pittenweem. 2019: '369 Remembered - The Men', Summerhall, Edinburgh. My paintings from Public Collections, including Art in Healthcare; Clare Hall, Cambridge; Dundee Museums and Art Galleries, Dundee City Council; Duncan of Jordanstone Art College, University of Dundee; Kirkcaldy Art Gallery and Museum, Fife Council; and on loan to the Scottish Fisheries Museum, can now be viewed online at Art UK. Many drawings, collage and mixed media works were purchased for public collections but are not on view online. 1991: 'Forth Rail Bridge Centenary Trust'. 1992: 'British Rail Trainload Freight Division', Head Office, London, three works. 2013: Art work for 'sound festival' programme, 2013, Scotlands festival of new music Aberdeen and Shire. 2013: Abstracted Portraits - Tryptych for Irving Miskell Reid, Freedom, Dundee. 'The Russian Harpooner', 1987, is featured in 'Art in Scotland, 1978-1988', published by 369 Gallery Ltd., Edinburgh, 1988, p50. 'North Rona', 1992, is featured on the cover of the Winter 2012 issue of 'SUMMONS', Journal of the Medical and Dental Defence Union of Scotland. North Rona is part of the contemporary art collection and available for a health care setting from 'Art in Healthcare', Edinburgh. UK, USA, France, Spain, Russia, and Chile. 1989: Alice Bain, 'Tales of the Whale', review and image of 'Jonah', from 'Hunting the Big Fish', Art and Exhibitions List, The List, 1989. "If Alan Watson could not paint, he would write stories...The kind of detail with which Watson relates stories...are drawn into each picture...Watson is determined to let nothing get away in his work...". 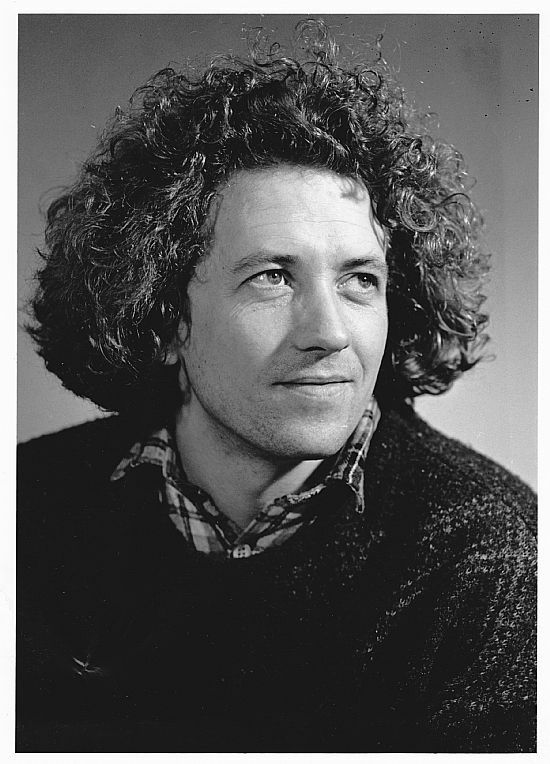 1986: Claire Blyth, 'Alan Watson', 'Artists and Illustrators'. Review. "...It is not only Watson's professional competence but also his sense of empathy which enables him to portray the inner as well as the outer man...". 1985: Edward Gage, review, 'The St Kilda Bird Culture', 'The Scotsman'. "...As if in a dream, men hang vertiginously off-balance above rocky outcrops and a misty ocean whose surface is etched with swirling currents and swooping gulls...". 1989: Murdo MacDonald, 'Hunting the Big Fish', The Scotsman,"...a body of work of real power and significance...". 1989: Clare Henry, Glasgow Herald, "The 369 Gallery continues its good run... Alan Watson has long painted pictures about the east-coast fishermen and their dangerous seafaring life... he has taken a great leap forward, inspired by the epic events of the nineteenth-century Scottish whaling fleets hunting the 'Big Fish'. A series of 25 large, authoritative charcoal drawings depict the gory details of planting the harpoon, finning out, pitch poling and cutting up the blubber together with strong studies of the whalers and their customs. Nantucket Sleigh Ride, Jonah, and Mrs Neptune are especially fine, while compositions involving diagonals, such as Krenger, and Spading the Fluke work well." 1991: Murdo MacDonald, review, image of 'Joiner at Errochty Dam, 'The Scotsman'. "...These finely composed images of Scotland's industrial past and present...serve to increase Watson's stature as a figurative artist...". Jimmy McGregor, McGregors Gathering, BBC Radio Scotland; Robert Dawson Scott, Kaleidoscope, BBC Radio Scotland. 2019: The Times, Review: '369 Remembered: The Men at Summerhall', Edinburgh, Giles Sutherland, 11 February 2019, "Verve, vigour and style..."
Peter J.M. McEwan, 'Dictionary of Scottish Art and Architecture', Antique Collectors' Club, 1995, p.594. Duncan Macmillan, 'Scottish Art in the 20th Century', Mainstream Publishing, 1994, 2nd revised edition, 2001, p.161. 'Art in Scotland, 1978-1988', 369 Gallery Ltd., Edinburgh, 1988, p14, p50. "Alan Watson is the youngest member of the group, and though a little more affected by the New Figuration, displays a sense of poetry which imbues his canvases with a haunting quality which is further enhanced by his rythmic line and sonorous colour harmonies...". Introduction written by Andrew Brown, 1989, p6, 'Contemporary Scottish Painting from the 369 Gallery Edinburgh', The Palace of Youth, 10th April to 2nd May 1989. Includes two images of Alan Watson's paintings from this exhibition on pp14-15 of the catalogue. 'SUMMONS', Journal of the Medical and Dental Defence Union of Scotland, Winter 2012, cover page. and many more - this page and website is a work in progress. Copyright 1990, Peter Adamson, St Andrews, reproduced with permission.